Today, I'm delighted to host my friend Julie Carobini. She writes fun stories set in California along the ocean. She has a new book releasing this week, and it's another good one. I read -- no, savored -- Fade to Blue over several days, letting myself enjoy the heroine's journey. In honor of the release of Fade to Blue, I'm giving away a copy of Sweet Waters, the prior book in the Otter Bay series. To be entered leaving a comment about your favorite ocean/water escape. Congrats to winner Sarah Forgrave. Suz Mitchell is a determined dreamer and won't allow her ex-husband Len's jail sentence to ruin their young son Jeremiah's life. An accomplished artist, she moves with her child across the country to California's central coast and lands a job restoring priceless art for the historic Hearst Castle overlooking the ocean. A serious old flame, Seth, also works at Hearst and jumbles the dreams inside Suz's heart. While sorting out the awkwardness of their past split and current spiritual differences, a repentant Len shows up eager to restore his family. What I loved about this story is that Suz is a gal I wanted to bring home for coffee. I needed to know how she waded through so many issues and how they resolved. There also was a major twist at the end that I loved. It really upped the stakes and made me love the outcome all the more. If you would like to read the first chapter of Fade to Blue, go HERE. I always want to know how people got started writing. Where did your interest start? What surprised you as you wrote this book? Are there specific lessons you hope readers will learn and apply to their lives after reading your book? How does the book intertwine with God’s call on your life and how you are currently serving Him? This story reminds me not to dwell on the past, but to prayerfully, joyfully—and ‘hope’fully— move forward. Such lessons there! Suz Mitchell made mistakes in her past—so have I—yet healing brokenness and restoring souls is God’s business. Praise him for that! Anything else you want to add in closing? 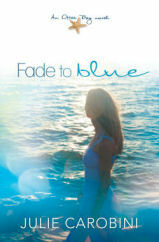 I really enjoyed Fade to Blue, it was like visiting the ocean, especially since it is still so cold here. I am actually in the middle of reading Fade To Blue right now but I don't have any other of Julie's books so I would love to be entered in this giveaway. One of my favorite places is Chincoteague Island. Lovely horses and beautiful place! Thanks! I have read a few of Julie's books and have really enjoyed them. Would love to get entered for this giveaway. As far as beach getaways, I'm a big cool-weather beach fan, especially on Michigan's north shores. There's something so serene about them...They don't have the loud roar that ocean beaches do, and they're less cluttered with things and people. Thanks for offering this giveaway, Cara. Hope you have a great week! I have not had a chance to read any of Julie's books yet. I would love to win Sweet Waters and get to know her books. Thanks for the chance to win. I've heard about this series and would love to read it. My favorite beach spot would be on the West Coast of Florida. (Haven't been on the eastern side) and loved the white sands, wonderful water around Tampa Bay area. Spent time there several different springs and really enjoyed it. I'm stuck in the midwest haven't been to any ocean, but I'd love to I'm not real picky which one. However, my daughter is moving to VA in the fall so maybe the east coast is more of a possibility than the west. I have not read any of Julie'a books but Fade to Blue sounds like a book I would enjoy. In fact I intend to seek out her other books. Please count me in for the giveaway. I would love to be entered....anxious to read Julie's book(s). I enjoy ocean/marshes in Charleston area....cause daughter lives there!!! Thanks! Another new author for me, YEAH!!!!!! I am grateful for the chance to win this book! I love to get lost in the story and the beautiful setting, that I can revel in God’s creation and fall in the love with the concepts of forgiveness, sacrifice, and grace with a major twist at the end that I would love to find out the outcome of Fade To Blue. By the post I am hooked to read this book!